Remember, we might have March Madness overtime so we ask those that get to view the show on channel 5, the Philippines? and Canada or wherever NOT to spoil the show outcome until we all get to view it together going by the usual East Coast schedule but with probable time delay. CBS will have three games in the 5 p.m. window for the NCAA Tournament. Their projected start times are 4:50 p.m., 5 p.m. and 5:20 p.m.
Each game takes just over 2 hours to complete. CBS will cut into each game so the entire nation sees the finish and then the East and Central time zones will join 60 Minutes in its entirety probably around 7:30 p.m. So expect TAR to start around 8:20 - 8:30 p.m. provided there's not an overtime period. I get the CBS Sports press releases so I do have their tip times for the Tournament for this weekend. Note that CBS plans to cut from one game to the other, so it is whichever is the last game finishes of those 3 that determines the end of NCAA Basketball tonight. SO, the first two will finish aroudn 705pm and whether CBS elects to hold the East Coast 60 Minutes broadcast of President O'Bama for the compleiton of the thrid game is the open question. My contacts at CBS have told me after eight days of promotion, they're not going to cut the Obama interview from the lineup nor will they cut TAR. The entire lineup is running as planned. The earliest 60 Minutes can run with a break for network and local commercials is 7:35 p.m. and that depends if everything runs on time. Big East teams like Louisville have a tendency to play games for more than 2 hours so expect the game to run past 7:40 p.m. on the East Coast. For those of you have CBS Eye-lert via text or e-mail, be ready for notification in the 7:30 - 7:45 p.m. range. And yes, Joab, keep your fingers away from the keyboard for longer than you normally do. What? He doesn't have wireless underwater? It's all cool. However, if we get a repeat of UConn vs. Syracuse from the Big East tourney, that's a different story. As an eyewitness to these games, I disagree on the finish time. Both Marquette/Missouri (unless it goes OT, which is possible) and USC/Michigan State (which could also go OT) have about 9 minutes left. The Louisville/Siena game has 14 minutes left. This indicates a finish well before 735pm if there is no OT. It's 7:31, ap. With the fouling in the Siena-Louisville game, it's going past 7:35. I know these things. 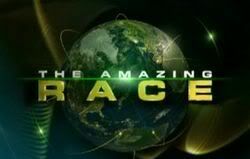 8:50/7:50 p.m. start time for Amazing Race. whats bout global tv , canada channel...... who got it?? If you have it, don't post here until the show is over for people in the US. Yes, Canada must keep quiet. Although 60 Minutes has a fascinating story about a homeless man who is so talented and can play the cello. Hi guys! Update here! TAR has finished already! Next week looks even better than this week! Ok, thanks mooyou, but please don't reveal anything else. Of course Ken, I'll keep all of you on the edges of your seats! Don't you worry! Officially from CBS Eye-lert, start time is 8:51 p.m., but I was pretty damned close.